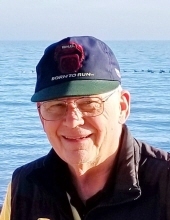 Ralph Earl Kraft, 79, of Sheboygan, passed away Tuesday, March 26, 2019 at Aurora Sheboygan Memorial Medical Center. Ralph was born September 23, 1939, in Manchester Township, to the late Earl and Elsie (Paul) Kraft. He grew up on a farm in Green Lake County, WI, learning how to drive at a very young age. Ralph graduated from Markesan High School in 1957 and enlisted in the United States Army where he served for three years. He was in the 62nd Engineering Battalion at Fort Leonard Wood, MO. Soon after his honorable discharge in 1960, he began work with Kohler Company. On September 4, 1965, he married the former Ann Mayer in Sheboygan. The couple had two children. After 47 years, Ralph retired from the Kohler Company as the general supervisor of Electric Melt in 2007. He loved to read, was an avid golfer and enjoyed staying current with technology trends. In addition to his wife, Ann, he is survived by his daughter, Roberta “Bobbi” Kraft, Waco, TX; his son, Christian William Kraft, Brown Deer; his two grandchildren, Andrea Childs and Kaleigh S. Kraft; one sister, Jeannine (Merrill) Dohrman, Waupan; his brother, Jim (Jane) Durkee; his sister-in-law, Theresa Kraft and his brother-in-law, Mike Schicker. In addition to his parents, he was preceded in death by his sister, Eileen Schicker and brother, Curtis Kraft. In accordance with his wishes, no funeral services will be held. An Open House Reception will be held from 2:00 p.m. until 5:00 p.m. on Saturday, April 6, 2019, to enable friends and family to have an opportunity to gather together, visit and share stories at Sheboygan Senior Activity Center (428 Wisconsin Ave., Sheboygan). Memorial donations can be made to Bookworm Gardens in his name. The family would like to extend a special thank you to the staff at Aurora Medical Center, Grafton, Aurora Sheboygan Memorial Medical Center and the Sheboygan First Responders. To send flowers or a remembrance gift to the family of Ralph Earl Kraft, please visit our Tribute Store. "Email Address" would like to share the life celebration of Ralph Earl Kraft. Click on the "link" to go to share a favorite memory or leave a condolence message for the family.